In modern life, all of us know how important a logo is for a business. Logos are like the symbol of a company or a brand, and it speaks for your business. It’s no doubt that a business can’t develop well without an effective logo. Meanwhile, we also know how expensive it is to hire a professional designer to customize a unique logo, especially for the bloggers and small businesses. They have no powerful capital and most of them know nothing about design. Also, it is hard for them to get the right logo in the case of a budget problem. Here’s where free online logo maker tools like DesignEvo comes in. DesignEvo logo maker is a web-based graphics tool that allows you to create logos online easily. It owns a vast built-in database and offers you 3,000+ delicate logo templates with millions of qualified vector icons, stylish fonts, various shapes, and powerful editing tools. With them, you can definitely turn your ideas into visual work. What’s more, all the resources are easy to use and require no professional skills. With DesignEvo, bloggers and small business owners have the chance to make logos on their own. It won’t take much money or time to create. Even if you don’t have the professional knowledge or skills about design, you can use DesignEvo logo maker easily. It is a handy tool that was created to help people who need logos without much budget. Besides, the relaxed design experience will stimulate your design interest, which lets you enjoy designing. Meanwhile, you may learn something about design on your own in the process of creating logos. So it’s like killing two birds with one stone. Next, I’ll show you how to make a stunning logo in minutes. In order to simplify your design process, DesignEvo has prepared 3,000 well-designed logo templates for you under various categories. No matter what kind of logos you need, be it gaming logos, sports & fitness logos, fashion & beauty logos, etc., you can find out a satisfactory one here. By the way, once you select a preferred template, you can start adjusting every element of it to customize your own logo because all the templates are fully customizable. You don’t need to worry if you have no idea how to start a logo, these templates will inspire you. If you have already come up with what kind of logo you need in mind, you can start from scratch. DesignEvo has a built-in database, which enables you to search millions of vector icons in all kinds of fields. Search for a keyword, and you’ll see many icons here, and then you can choose a preferred one to be the foundation of your logo. There is a list of popular searches under the search box, which mentions popular search ideas in case you don’t know what to search for. Moreover, DesignEvo offers a search history to let you know what you have searched. Isn’t it convenient? Design, to some extent, is to combine some elements to create a new one. So it is not quite unnecessary to add some other graphics to make your logo even more beautiful. There are many kinds of qualified shapes that await you, such as badges, decorations, lines, solid shapes, outlined shapes, banners, and symbols. Every figure is well-designed and useful for logo designing. Just select one or two of them to add to your logo and then adjust the color, background, layout, effect, and so on to get a perfect logo design to meet your needs. In addition to the shapes, don’t forget to choose a font to decorate your blog or company name and slogan. The name and slogan often describe your business, so you should give more importance to them. DesignEvo provides two types of fonts for you, classic fonts and art fonts. Every font is beautiful and unique in a variety of styles. Choose a suitable one to beauty your words, and let the words express your company culture and concept. After finishing all the adjustment, don’t forget to preview it before downloading. DesignEvo develops the preview feature for you to check if the logo is satisfactory. You’ll simply see some example previews of where your logo will often be used – on a book cover, on a website, on a wall, on a business card, on a T-shirt, etc. Then you’ll know if it is suitable. If not, go back to redesign and save yourself a lot of time and energy, as you needn’t start from scratch again. When everything is done and you feel that you’ve come up with the best logo for your website, download your logo to a safe place on your computer’s hard disk. Now you may feel happy with your artwork. You can also see how DesignEvo works from the below video, it will show you directly how to make a professional logo in a few minutes. Not everyone is gifted in all fields and no one is omnipotent. So, as when you have trouble with something, you try to find an assistant to help you, DesignEvo is the best assistant for you in designing logos. It is powerful, easy to use and resourceful. 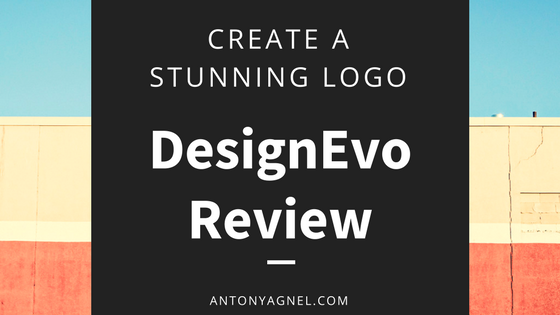 With DesignEvo, you can create a great logo for a professional appearance even if you’ve never learned anything about designing and logo design best practices. A successful business needs a successful logo. When your business is not that great, it is mainly due to bad logo design. Just hop on to DesignEvo to get a new logo right away and project your business in the best light possible to make it even more successful. PS: Keep your logo simple. After all, simplicity is the ultimate sophistication. Creating a logo with complicated designs can create barriers to communication, so don’t create an over-crowded logo. Keep it simple and use a few elements to combine and beautify it. A complicated logo is not only illegible but also hardly appealing to the audience. To some extent, simple means complicated. The logo is a mark, not a declaration. It needs to be kept simple to speak more about your business and attract more clients to you. Thus I hope that you found my article useful in learning about why you need a professional logo for your blog or business, what makes a good logo design and how you can use a free online logo maker like DesignEvo to design and download your logo for free. Pin this on Pinterest would you? Thank you for this interesting post! 👍😊 I’ve marked it and I’ll take a look later! You’re welcome Emanuela, don’t let it sink among your other bookmarked posts. Read it when you’re up for it and do share it with your followers so that they might find it useful too. is this a paid site? Her Arv, DesignEvo is a free logo design site with optional paid upgrades. The free plan is enough for bloggers like us. But if you need maximum resolution, print-ready logos with lifetime support, you can go for their paid plans. Since I started following your blog I’ve learnt so much and that’s why I’m nominating your blog for the Sunshine Blogger Award. Here’s the link (link removed). Oh hey, I’m glad to hear that you’ve learned much from my blog but unfortunately, I don’t do these awards thing. I hope you understand, thanks. You’re welcome Jeanny, hope you found it useful! Thanks for posting. I completely agree before starting any new project a good quality logo is the first thing on my list. You’re welcome Doug, I’m glad that you agree with my post. I have struggled for years to create or find a tool to help me create decent logos. This is incredibly helpful. Hey Linda, I’m glad to hear that you found my post helpful. After reading your comment, I only wish I had written it earlier. Happy to find your new “place”…. Your post is very helpful and fully detailed…. a lot of people will find it useful to learn or improve their sites… good job! Hey Barbara, thanks for taking the time to leave your comment over here. By the way, it’s great to hear that you found my post detailed and very helpful.